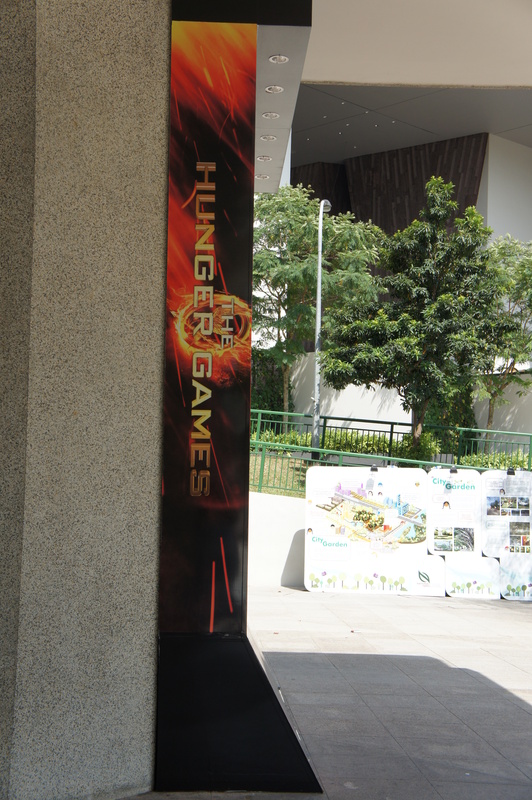 Following ‘The Hunger Games’ stand and huge characters posters of Jennifer Lawrence as Katniss Everdeen and Liam Hemsworth as Gale Hawthorne spotted in Cathay Cineplex inside Causeway Point, this large ‘The Hunger Games’ stand was spotted being placed outside The Cathay. Look at the size of the stand against the people walking by as well as the entrance of The Cathay. It’s huge! Here is what it looks like close up. Here’s the side view of the stand. 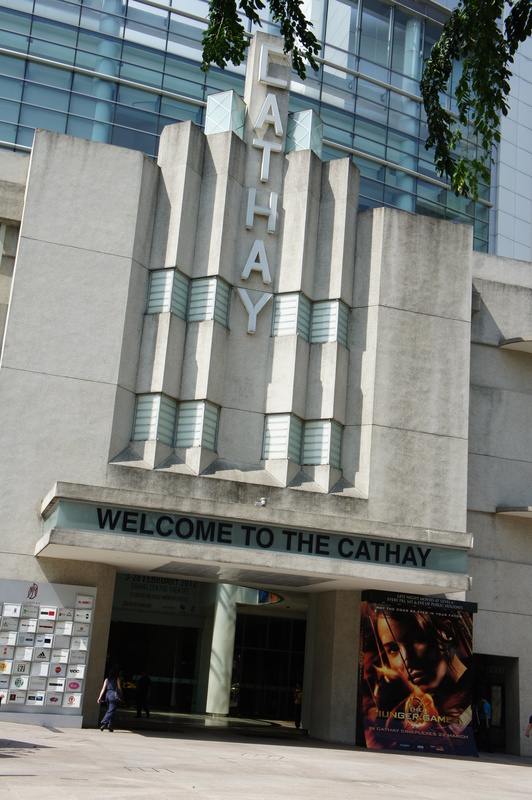 As The Cathay is located in business district and is also very near to Singapore Management University and School of Arts Singapore along with hotels nearby, there are lots of people walking pass The Cathay every single day. We are sure the public will not be able to miss seeing this stand! SPOTTED: Katniss Stand Along With Katniss And Gale Posters In Causeway Point Cathay Cineplex! While The Cathay has turned into a ‘The Hunger Games’ paradise recently from ‘The Hunger Games’ snow globe to Katniss Everdeen and Gale Hawthorne posters spotted outside toilets to besides ‘The Hunger Games’ teaser poster that featured the flaming Mockingjay pin, the new “The World Will Be Watching” poster featuring Katniss Everdeen and Peeta Mellark and huge banner of characters posters are also found in The Cathay. We are around a little more than a month away from the release of ‘The Hunger Games’ movie in Singapore and we are certainly happy to see Cathay-Keris Films starting to expand their promotions to other Cathay Cineplexes outlets besides the one in The Cathay mall besides introducing ‘The Hunger Games’ Combo in Cathay Cineplexes outlets. We are also happy to see ‘The Hunger Games’ stand is not only displayed in Cathay Cineleisure but also Cathay Cineplex in Causeway Point too! This stand according to @Lizzy_WARP is placed near the lifts. Besides the stand, huge characters posters of Jennifer Lawrence as Katniss Everdeen and Liam Hemsworth as Gale Hawthorne was also displayed on top of the entrance where you have to pass through to enter the cinema halls. We are sure the public will not be able to miss it! Great promotions by Cathay-Keris Films! Thank you @Lizzy_WARP for the photos and @taarawilleatyou for the tip! 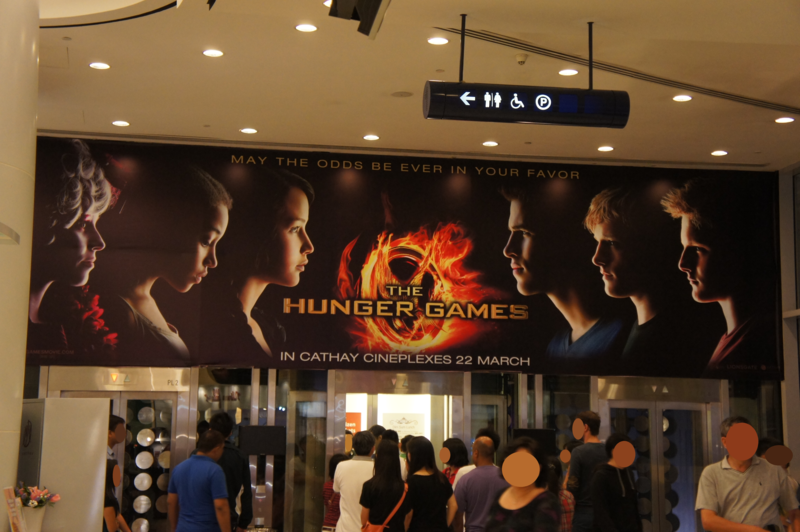 Did you see any ‘The Hunger Games’ franchise related promotions in Singapore which we haven’t reported yet? Do send us a tip or photo(s) at hungergamessingapore@gmail.com! ‘The Hunger Games’ posters are spotted on the TVs which display movie screening timings in both Cathay Cineplex inside The Cathay mall and Cathay Cineleisure. We believe this is the same in all Cathay Cineplexes outlets. 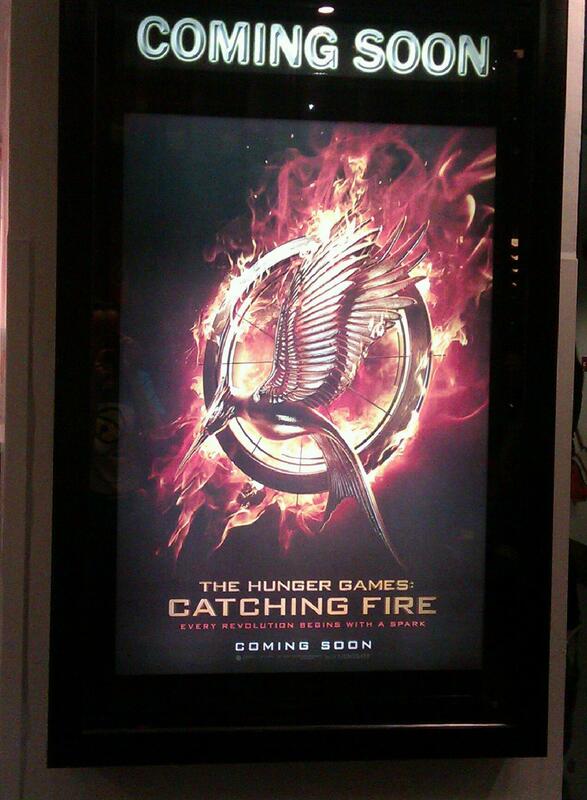 Check out the pictures of ‘The Hunger Games’ posters being shown on the TVs which display movie screening timings below. Besides that, final ‘The Hunger Games’ poster of Katniss Everdeen taking aim with her arrow is displayed in “Coming Soon” in level 9 of Cineleisure in Orchard along with a stand of the same said poster. The only difference on the poster as compared with the one Lionsgate had released, besides the release date, Cathay-Keris Films has changed the tagline from “The World Will Be Watching” to “May The Odds Be Ever In Your Favor” which was originally used on ‘The Hunger Games’ teaser poster and teaser trailer. Take a look at the low quality pictures below. ‘The Hunger Games’ poster featuring Jennifer Lawrence as Katniss Everdeen taking aim with her bow and arrow. ‘The Hunger Games’ stand featuring Jennifer Lawrence as Katniss Everdeen taking aim with her bow and arrow. We’ll update this post with high quality shots as soon as possible. 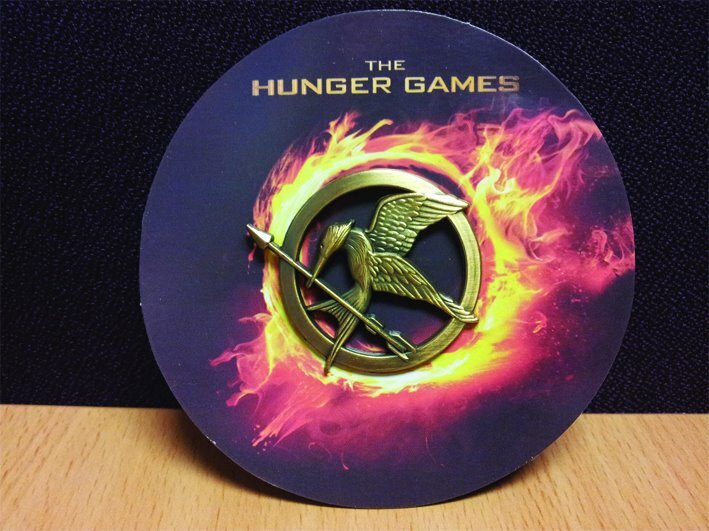 What do you think of the promotions for ‘The Hunger Games’ in Singapore so far? 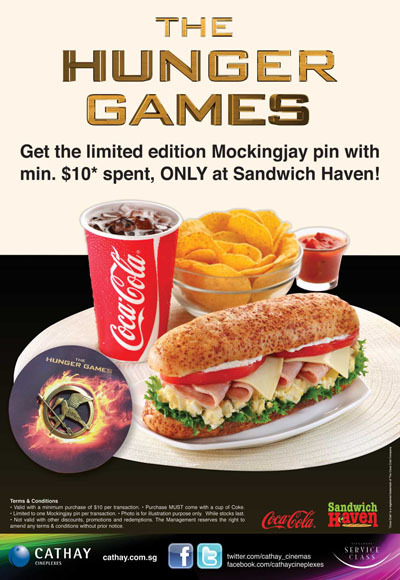 We have posted about ‘The Hunger Games’ Combo available in all Cathay Cineplexes outlets. 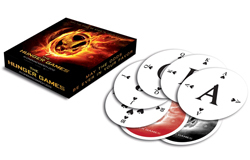 If ‘The Hunger Games’ Combo is not to your liking, here’s another way where you can get your hands onto a pack of ‘The Hunger Games’ poker cards. Spend a min. of $58 to receive a pair of Spring Awakening tickets worth $110 and a box of limited edition playing cards from the upcoming movie The Hunger Games at The Cathay. Head over to The Cathay website for details. Have you ever wanted to step into the luxurious world of Cathay Cineplexes Platinum Movie Suites? Cathay Cineplexes is now holding a contest where not only you, but also 27 other friends, will get a chance to attend an exclusive screening of a movie in Cathay Cineplexes Platinum Movie Suites! 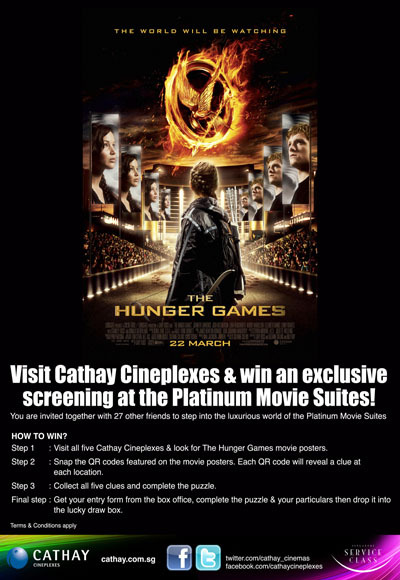 Step 1 : Visit all five Cathay Cineplexes & look for The Hunger Games movie posters. Step 3 : Collect all five clues and complete the puzzle. • All entries must be submitted by 29 Feb 2012 and only the winner will be notified via email. • All employees & family members of Cathay Cineplexes Pte Ltd and Cathay Organisation Holdings are not allowed to participatein this promotion. • Movie screening at the Platinum Movie Suites can only be held between 23 Mar – 28 Mar 2012. • Timing and choice of movie will be determined by Cathay Cineplexes Pte Ltd.
• Prize is not exchangeable for cash in part or full or other items. • The Management reserves the right to alter the terms of this promotion or withdraw any of the prizes featured without prior notice. • By participating in this draw, all participants are deemed to have given their consent to receive promotional and marketing materials from Cathay Cineplexes Pte Ltd.
Alternatively, you can always head over to Cathay Cineplexes for information about this contest. You can also find out more about Cathay Cineplexes Platinum Movie Suites here. We have to say this is a great promotion for ‘The Hunger Games’ movie as even if those who are hunting for ‘The Hunger Games’ posters to enter this contest have not heard of ‘The Hunger Games’ before, this might just be the trigger for them to find out more about ‘The Hunger Games’ and become fans of ‘The Hunger Games’ too! May the odds be ever in your favor. Let the games begin! 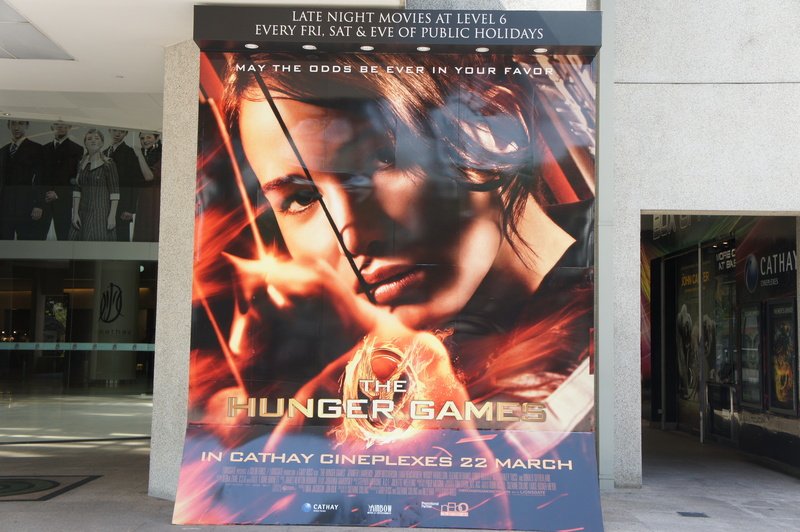 Read Hunger Games Singapore’s experience on this hunt here! The Cathay has turned into a ‘The Hunger Games’ paradise recently from ‘The Hunger Games’ snow globe to Katniss Everdeen and Gale Hawthorne posters spotted outside toilets. Besides ‘The Hunger Games’ teaser poster that featured the flaming Mockingjay pin, the new “The World Will Be Watching” poster featuring Jennifer Lawrence as Katniss Everdeen and Josh Hutcherson as Peeta Mellark are also spotted in The Cathay. Another trip to The Cathay today and there are even more surprises in store. ‘The Hunger Games’ character posters that were released previously are now combined and made into a huge banner on top of the lift at level 1 in The Cathay. You certainly wouldn’t miss it when you are entering The Cathay mall! Like Katniss Everdeen and Gale Hawthorne posters spotted outside toilets in The Cathay mall on every level, Katniss Everdeen is facing Gale Hawthorne. We think perhaps Cathay is planning on not giving any spoilers away. You can’t deny Gale Hawthorne is a good friend of Katniss Everdeen too. What other surprises are in store for Hunger Games fans in Singapore? 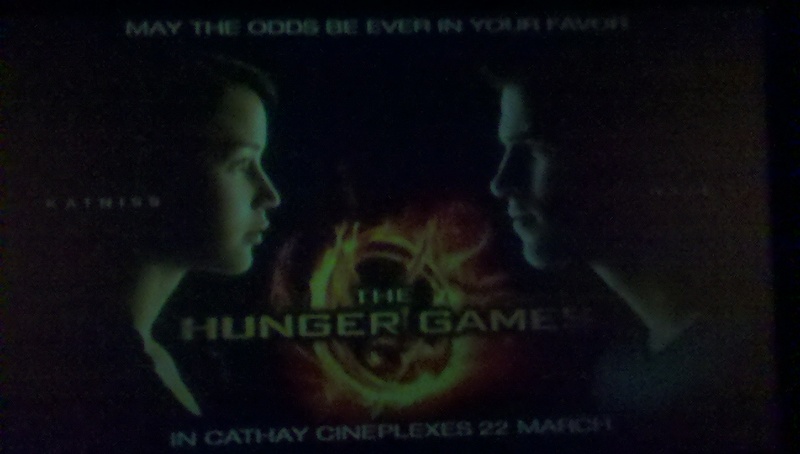 Will ‘The Hunger Games’ related ads be plastered over in other Cathay Cineplexes and even other cinemas too? Only time will tell! No matter what, keep checking back for we promise to bring you latest updates as soon as possible! The Cathay has turned into a ‘The Hunger Games’ paradise recently from ‘The Hunger Games’ snow globe to Katniss Everdeen and Gale Hawthorne posters spotted outside toilets. 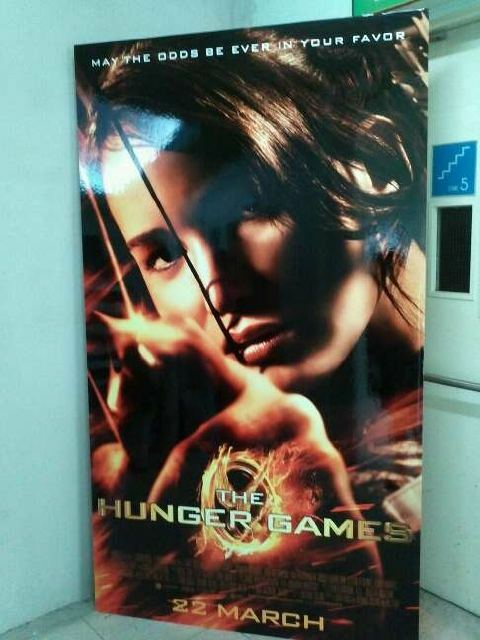 Shortly after the new ‘The Hunger Games’ poster featuring Katniss Everdeen and Peeta Mellark was released, our reader, ShiLi, spotted the poster in level 5 of The Cathay shopping mall. This poster can also been seen in Basement 1 of The Cathay. Besides that, one of our administrators, Trish, has also reported that ‘The Hunger Games’ full trailer was being played in the screen above the hand dryer in The Cathay toilets. Many thanks to ShiLi for the tip and photo! No. You didn’t read the title wrongly. 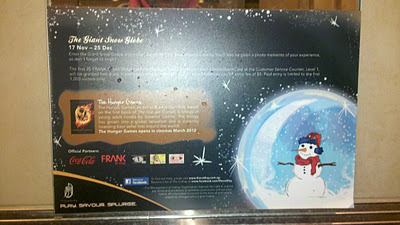 Fellow Hunger Games fan, Liyana, went to take a look at ‘The Hunger Games’ snow globe in The Cathay which we had previously written about. Liyana’s trip to The Cathay was very much like ours, except that she had made some interesting discoveries as to new additional promotional posters and banners were placed in The Cathay. 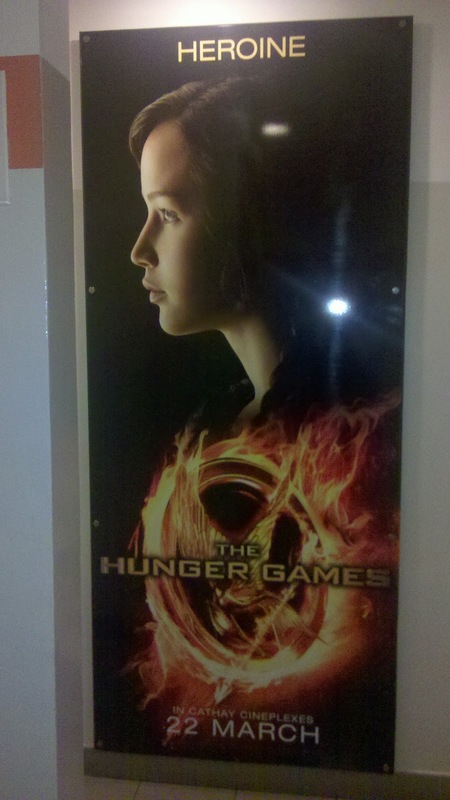 Katniss and Gale character posters were placed outside the female and male toilets respectively. According to her, they can be found outside toilets in The Cathay on the 2nd and 3rd levels. It is assumed that these posters can be found outside the toilets on other levels in The Cathay as well. How do you feel about Katniss and Gale staring into the female and male toilets? What do you think about Katniss being labelled as “Heroine” and Gale as a “Hero”? This is certainly a bit of interesting promotion by Cathay Cineplexes considering how heavily they are promoting Katniss and Gale as a couple. This is not the first time they had done so as we had reported earlier on Katniss and Gale poster sightings in E!Hub Cathay Cineplexes outlet. The Cathay is turning a Hunger Games fan wonderland where ‘The Hunger Games’ promotional materials are practically everywhere in the mall. Promotions for ‘The Hunger Games’ left their traces in toilets as well. This feature about ‘The Hunger Games’ snow globe along with a summary of ‘The Hunger Games’ was found in the female toilet in The Cathay. 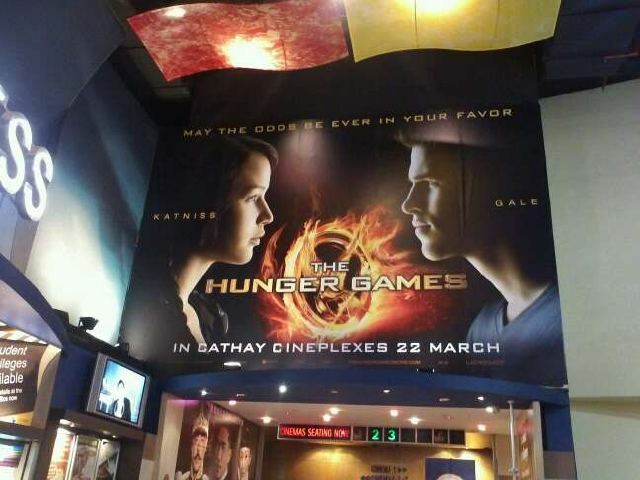 Besides that, Katniss and Gale character posters are also shown along with ‘The Hunger Games’ logo before movies in Cathay Cineplexes too. 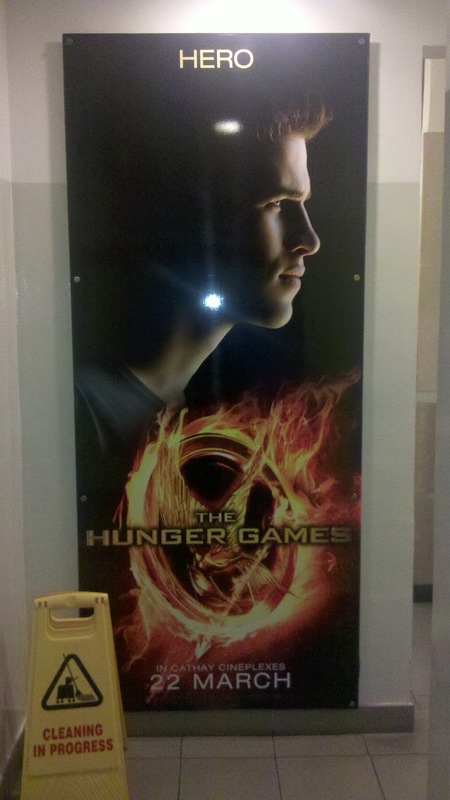 We are around 3 months away from ‘The Hunger Games’ release and promotional items are already in placed in Cathay Cineplexes. We can’t wait to see what they will do next, especially outside Cathay Cineplexes. Many thanks to Liyana for the photos and tip.